Coconut Blossom Sugar or Coconut Sugar is a real rarity which is produced in a complex manual process. This organic sugar can substitute traditional sugar in almost any dish or drink and provides a spectacular caramel-like flavour. But there’s even more to Coconut Blossom Sugar: because it is not refined, it implicates a large amount of nutrients second to no other sweetener or syrup. All of this makes coconut blossom sugar the perfect sweetener for those who value a conscious and healthy diet. Coconut blossom sugar contains numerous vitamins and minerals like magnesium, iron and zinc as well as natural antioxidants which serve as so-called radical scavengers. Acquire a taste for coconut blossom sugar and sweeten your drinks or cakes and desserts with this natural sugary treat. In teas and cocktails the coconut blossom sugar leaves behind a deliciously caramel-like aroma. Whenever you would normally use syrup or conventional sugar simply use coconut blossom sugar instead. Give it a try! As a source for inspiration you can have a look at our recipes. How is coconut blossom sugar produced? Dr. Goerg Premium Organic Coconut Blossom Sugar is completely pure, without the addition of cane sugar, maltodextrin or artificial colors. The sugar is obtained from coconut trees from monitored organic cultivation and is produced manually by small-scale Philippine farmers. For the production of coconut blossom sugar, the palm tree’s inflorescence is cut daily in order to obtain its nectar. This way, one liter per day and tree can be gained. Through constant stirring and heat, the coconut nectar is processed into syrup until a complete crystallization has occurred. During the last production step the sugar is sieved in order to achieve a fine grained texture. This procedure is time-critical and requires a lot of experience. 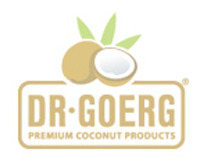 This time-consuming, manual process ensures the outstanding quality of Dr. Goerg Premium Coconut Products.